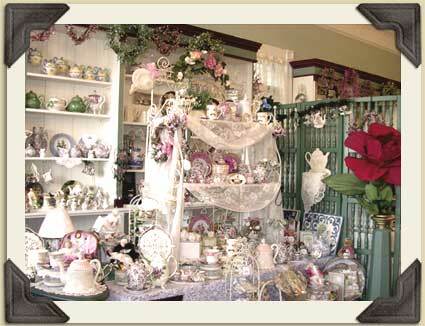 Housed in a 1910 Victorian storefront for over 30 years, our beautiful gift shop takes you back to a time of elegance and charm. Here you can browse our unusual and unique array of distinctive, yet affordable, gifts. From the moment you enter the charming shop, you will be surrounded by tranquil music and the delicous aroma of scones baking in the oven. The gift boutique is filled with home decor, gourmet specialties, seasonal treasures, custom wreaths, collectibles, candles, and beautiful jewelry. Specializing in Tea Accouterments, you will find a varied array of teapots, teacups and saucers, publications, children's tea sets, tea accessories as well as numerous varieties of loose leaf teas. New Leaf Gift Certificates are available in the amount of your choosing and can be used in the store or in our tea room. Our helpful staff will be happy to assist you in selecting and assembling a memorable gift bag or basket to fit any budget. The New Leaf Gift Shoppe is open Wednesday through Saturday 10:00am - 4:00pm. Copyright © The New Leaf Tea Room. All Rights Reserved.